A low-carb, keto noodle bowl bursting with fresh, crunchy vegetables and agar-based low-carb, keto noodles. Smothered in a creamy (dairy-free! 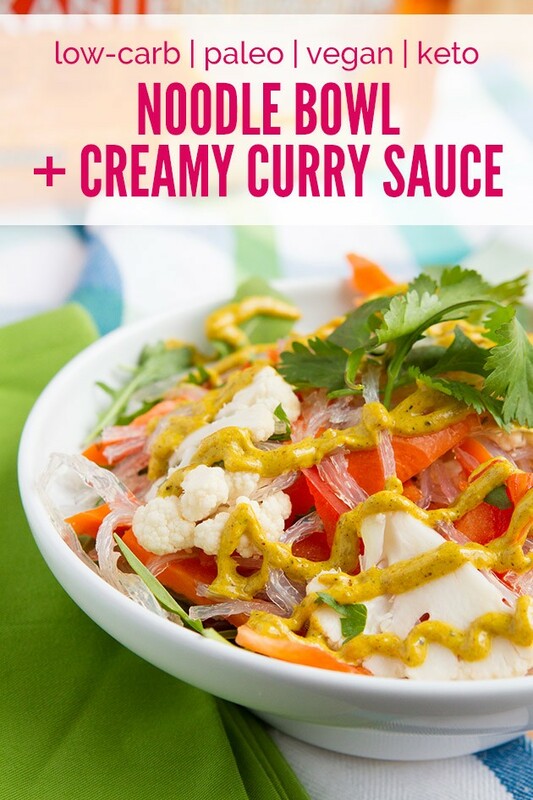 ), keto curry sauce. The keto sauce is so good, I call it “curry crack sauce”. Addicted… hard. I’ve discovered a new thing! 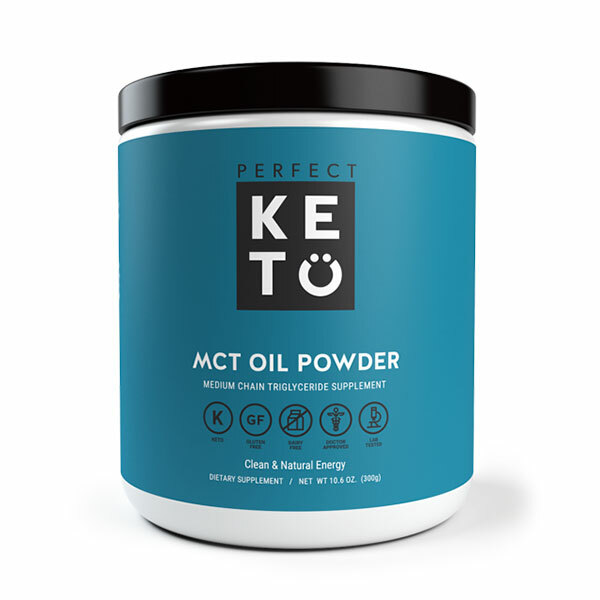 Before I get gung ho about a new keto product, I like to make sure it’s something that you’ll be interested in. 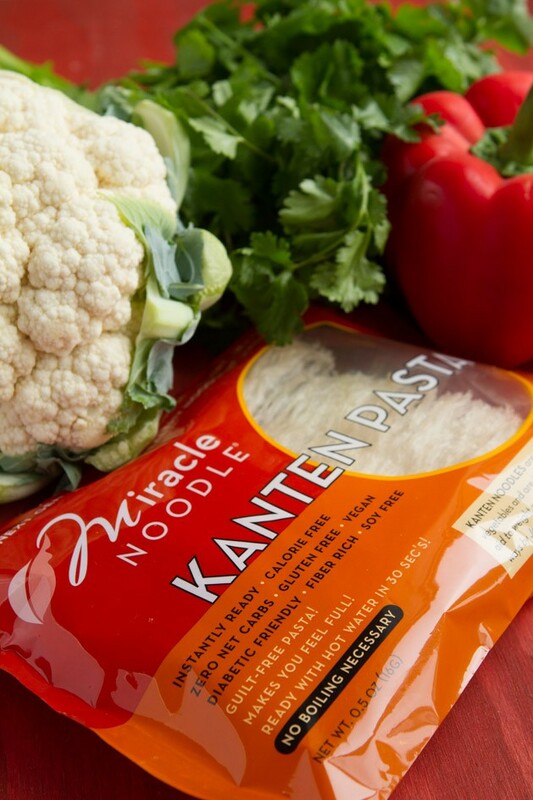 So, I shared these Dry Kanten Noodles on the Healthful Pursuit Instagram page and everyone went crazy for them. So here I am, sharing this new keto thing with you because you displayed endless excitement about it (so did I the first time I saw them). What are they? Low-carb, keto noodles! Only… they’re not your average soy-infested low-carb, keto noodle. These keto Dry Kanten Noodles are made with agar, a compound extracted from seaweed. Often used as a vegan alternative to gelatin. Asian cultures use agar to naturally suppress appetite and assist in weight loss. Additionally, agar is used to normalize blood sugar, treat diabetes and constipation. Consisting of a gel-like polysaccharide, agar bulks up in the gut to stimulate the intestines giving us the feeling a fullness, leading to less consumption and more elimination. Agar contains no sugar, no carbs (it has an equal amount of carb to fiber, so it is completely net carb neutral), with a touch of calcium and iron. By binding with toxins throughout the digestive process, it efficiently moves toxic waste out of the body. Other benefits associated with agar is its ability to reduce inflammation, calm the liver, and bring relief to the lungs. They’re naturally gluten-free, safe for vegans, keto peeps and kids love them, too. My experience preparing these keto Kanten Noodles for the first time… was uneventful, really. Place in bowl, add hot water, soak, drain, eat. One thing I did notice is that they have a slight seaweed smell to them when they’re soaking. But the smell went away after preparing and doesn’t transfer to the taste of the final keto noodle whatsoever. Just a heads up. If you are following a low-FODMAP eating style, I’m not comfortable recommending that you eat Kanten noodles, or natural seaweed products of any kind. Can’t do the keto noodles? Check the notes of this keto recipe for an outline of what to do instead. However, if you have had success with using seaweed to normalize your hypothyroid condition, these noodles are your friend! 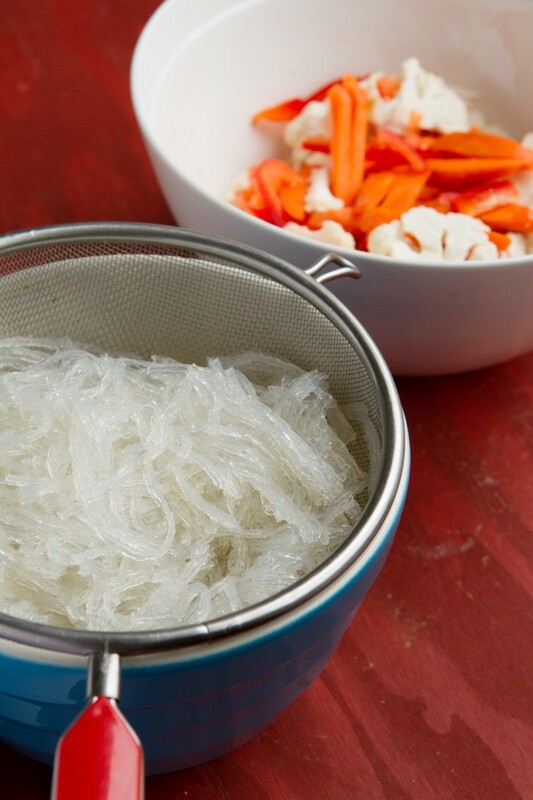 Rather than taking iodine in its straight form, many of my thyroid clients add natural seaweed products like keto Kanten Noodles to their daily rotation. 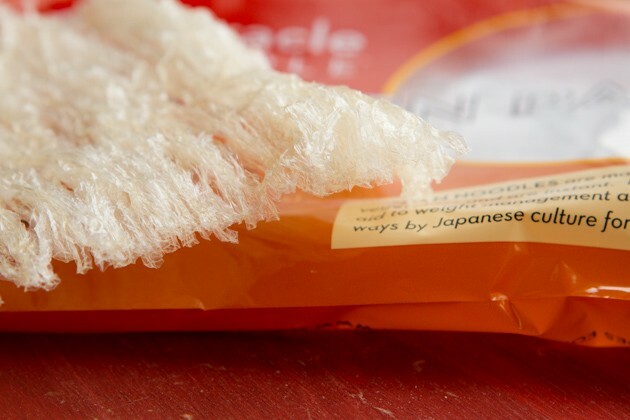 If your gut is happy, seaweed products (and these delicious noodles) are one more tasty tool that you can add to your low-carb, keto resource kit. 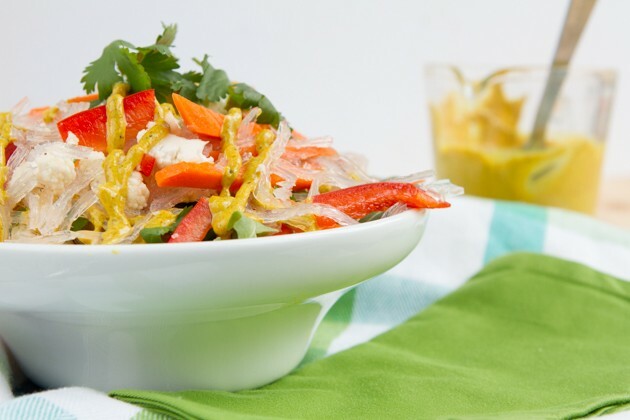 Low-carb, keto noodle bowl bursting with fresh, crunchy vegetables and agar-based low-carb noodles. Smothered in a creamy (dairy-free!) curry sauce. Prepare Kanten Noodles by placing the two sheets of noodles in a large bowl. Lightly heat a couple of cups of water, a couple of degrees below boiling. Think: hot water that you can drink. Pour water over noodles and set aside while you prepare the rest of the ingredients. After about 5 minutes of soaking, strain and set aside in a large bowl to cool. 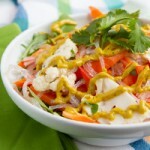 Add carrots, cauliflower, bell pepper and cilantro to the bowl with the noodles. Set mixed greens on 2 separate servings plates as the “base” to your meal. 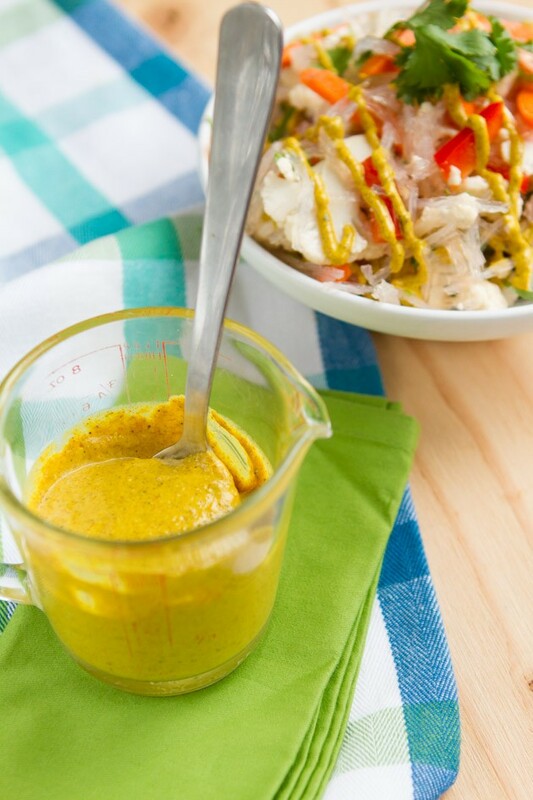 Then, add all of the Curry Sauce ingredients to the jug of your high-powered blender and blend until smooth. Pour over the vegetable and noodle mixture and toss to coat. Serve immediately or place in the fridge to cool for a couple of hours. Store in an air-tight container in the fridge for up to 2 days. Protein boost: I served this with a grilled steak on the side. Feel free to use anything here. If you’re low-carb or keto, add an animal protein. If you’re vegan, try roasted chickpeas or tempeh. Sesame-free: If you’re allergic to sesame or just not doing seeds, make this keto recipe with avocado oil mayo. Or, make your own mayonaise. Using mayo would make this keto recipe unsafe for vegans and those with egg allergy/sensitivity. Noodles: if you don’t have a couple of packs of Kanten Noodles in your pantry just yet, you could make this recipe with zucchini noodles. Where are you at with seaweed in your daily rotation? Something that you aim for? Avoid? Keto Q&A Videos: You Asked, I Answered!